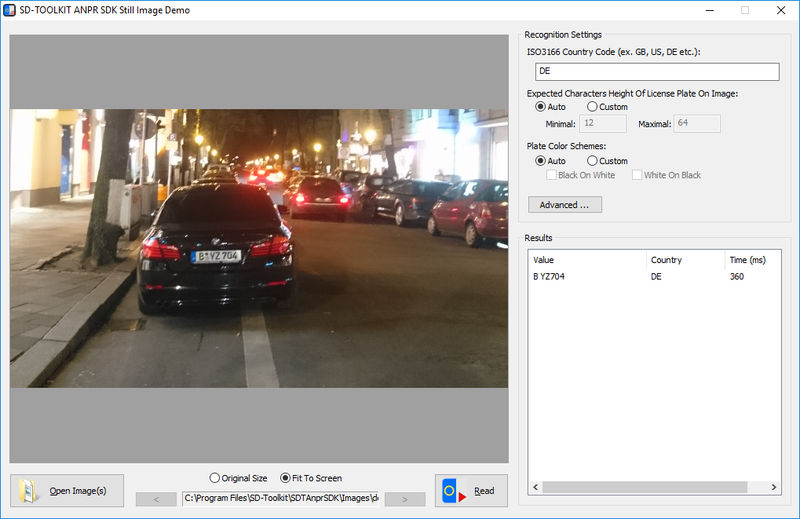 Based on 10+ years experience in development of machine vision automation solutions our team release royalty free SD-TOOLKIT ANPR SDK for Microsoft Windows. The Aronym ANPR is formed from the term "Automatic Number Plate Recognition". Another name of this tecthnology is "License Plate Recognition" (LPR). The SDK allows you to read license plate from visual sources such as images or video stream. 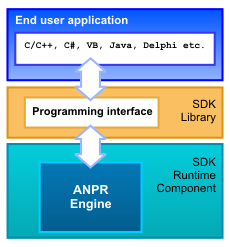 The ANPR SDK API is accessible by various programming languages such as C, C++, C#, VB6, VB.NET, Java, Delphi and many others. By using our ANPR SDK you will be able to integrate license plate recognition functionality into your application within several hours or even less. Tools, information, and sample applications are provided to help you integrate high performance ANPR functionality into your application or solution. To access ANPR recognition functionality use one of the Application Programming Interfaces (API) available. The API depends on programming language the application is written on or framework the application is working with. 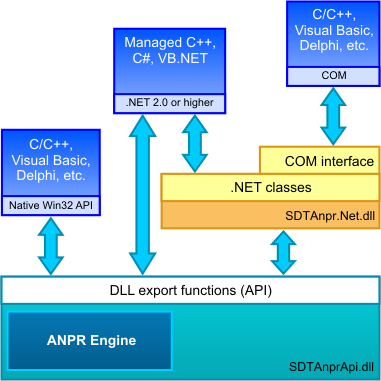 For example, to call ANPR Engine API from C# applications you can use either export functions of SDTAnprApi.dll or use .NET classes available from .NET assembly SDTAnpr.Net.dll. Each API have related runtime components set which your application is linked with and such runtimes components must be included later into your application setup when you will distribute your complete software to your customer. COM (SDTAnpr.Net.dll/SDTAnpr.Net.tlb): C/C++, C#, Visual Basic, VB.NET, Delphi, VB script, Java script, etc. SDTAnpr.dll - Native Windows DLL. Core ANPR API library. This library export functions can be called from most programming languages. SDTAnpr.Net.dll - .NET Assembly. A .NET wrapper on the top of native API developed as a .NET control for integration into C# and VB.NET application.